Join us for a presentation by Chris Vidal, Founder of Athletes USA and Jason Floyd, international golf coach who will explain how to secure your sons or daughters sporting scholarship and placement at a university in the USA. Athletes USA was founded in 2008 to help student athletes and their families to connect to college coaches within the NCAA, NAIA and NJCAA. The college recruiting process is very competitive, and often confusing for many athletes. Our team of former college athletes, coaches and scouts and our network of 20,000+ American college coaches allows our team to market student athletes to some ofthe world’s best known universities and more than 25 Sports. Sotogrande International School supports sporting students through their A-level, American High School Diploma and IB Diploma programmes which allows time for both sports and academics and encourages students to pursue their passion for their chosen sport at the highest level. 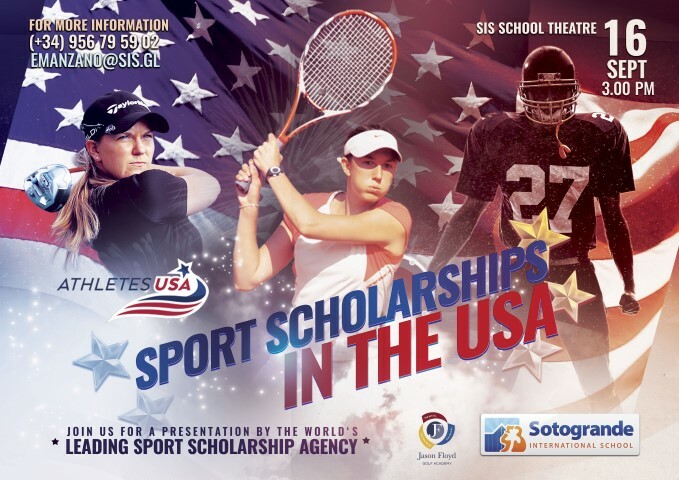 Through this partnership Athletes USA, Sotogrande International School and Jason Floyd Golf Academy have created a new and exciting athletic scholarships pathway programme delivering athletic scholarships to over 54 countries globally, focusing not only on golf but on any sport played at the highest level. If you are unable to attend in person, this talk will also be available via live streaming, please request log in details when confirming your attendance.